iMovR’s new mobile file pedestal is an excellent storage accessory to complement your adjustable height workstation. Made with high quality components, the same 3D lamination as the iMovR desks, and available in all of iMovR’s eleven standard colors, this file pedestal solves the problem of not having drawers on your standing desk. 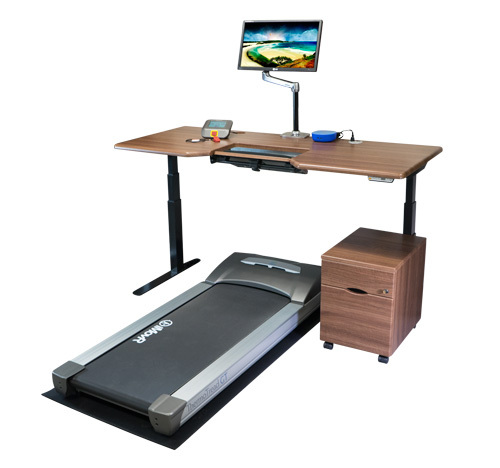 Its dimensions and mobility are a natural fit for the unique space constraints of a standing or treadmill desk, and its full-performance 5-year warranty reflects quality of this sturdy product. So sturdy, it can even be used as an extra rolling seat. Eleven color choices make it easy to match your décor, and 3D lamination grants the pedestal’s finish superior durability and longevity. It is clear that iMovR paid careful attention to every aspect of the cabinet to make sure it met the needs of standing and walking workers. From the pedestal’s weight, to its convenient caster mobility, to the complete finish on all sides, this mobile file pedestal is an excellent store solution for your stand up desk. The fact that it ships pre-assembled is an added bonus. 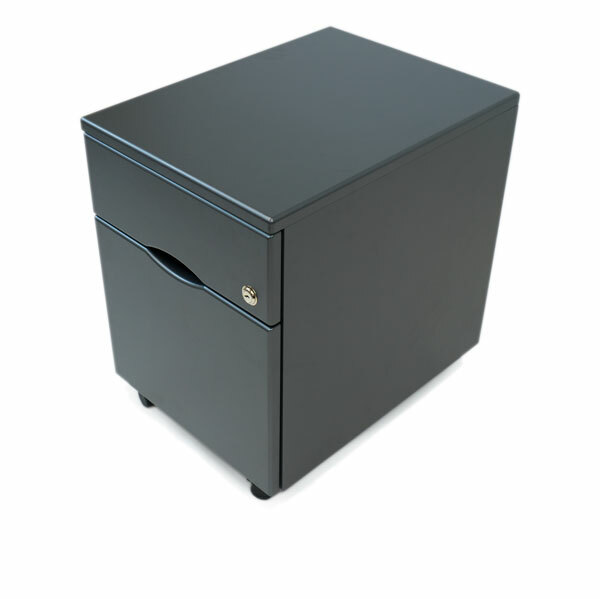 Long warranty means the pedestal should stay with you for a long time, and locking drawers mean your files and property will also remain safe. Two drawers should meet the needs of most workers, but some might prefer three. The heavy weight of the unit has many advantages but it does increase the integrated cost of freight. iMovR's mobile file pedestal is a well-built storage solution for any stand up desk or treadmill desk, and it shines especially well when paired with iMovR’s line of adjustable height desks. This mobile file pedestal’s high-quality ball-bearing rail system and ultra-dense weighted ballast, combined with iMovR's signature 3D lamination all around, make it the perfect storage companion for your desk. And with a stellar, 5-year warranty you can rest assured that you’re getting a product built to last. When users switch to an adjustable height stand up desk or treadmill desk, one of the challenges they encounter is the lack of storage space. 99.99% of stand up desks on the market do not offer file cabinets or drawers as a consequence of the desks’ need to adjust up and down, so users are tasked with finding more creative solutions for their workplaces (the 0.01% exception being extremely expensive and offering Lilliputian drawer space). One of those solutions is a mobile file cabinet. Being a piece of furniture separate from the desk gives the cabinet a couple of distinct advantages. For one, it doesn't have any effect on the weight capacity of your standing desk, and won’t induce unwanted “side loading” on the lifting legs. For another, the mobile aspect of the cabinet means it can be positioned wherever you need it as dictated by your room layout and individual preference. To address these myriad of challenges, iMovr's has revealed their own mobile file cabinet uniquely designed to blend in beautifully with a standing desk setup. 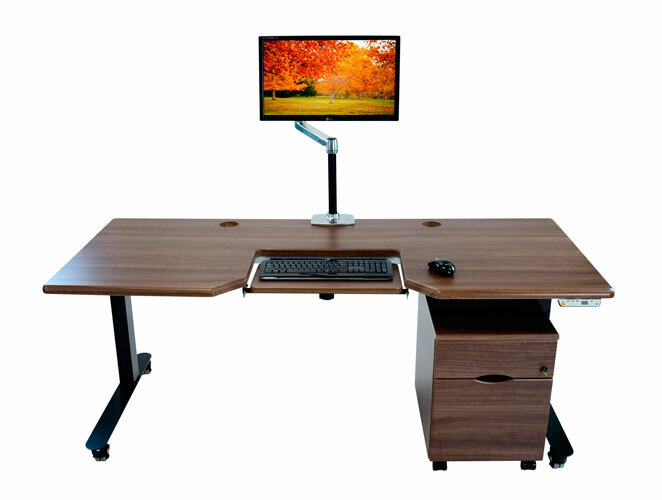 It's an effective storage solution that perfectly complements their own line of desks, with matching surface laminates and contours, but working equally well with most any other standup desk. Like all iMovR desks, this new file cabinet incorporates their signature 3D lamination, which makes it more durable and attractive than your run-of-the-mill file cabinets made of cheap metal or conventionally-laminated wood. Its dimensions are optimized for sitting either astride or in front of a lifting column, yet without sacrificing drawer capaciousness. iMovR’s mobile file cabinet arrives completely pre-assembled, always a plus since it means you won’t have to spend precious time putting it together like an IKEA project. Just take it off the pallet and put it where you want it. The first thing you'll notice is the cabinet’s handsome finish. Other, comparable cabinets use cheap veneers glued onto the wood, which risks delaminating over time. Even more heinous is the fact that many of these cabinets, to save money, skimp out on the laminate by leaving the back wood exposed. After all, the file cabinet is usually in front of a wall or concealed under a traditional desk with a vanity cover. But under stand up desks, which tend not to have full vanity covers, an unfinished back may be hideously displayed for your entire office to see. To avoid this, iMovR encases its file cabinet in the same 3D lamination as all of their table tops. Each panel—the front, top, sides, back, and even underside—features this advanced lamination, providing 360-degree scratch, ding and chemical resistance, superior durability, and protection from moisture damage. Moreover, the woodgrain colors give the entire cabinet the luxurious look of having been made from solid hardwood. The cabinet is designed specifically to fit beneath a stand up desk or treadmill desk without obstructing you or your desk. 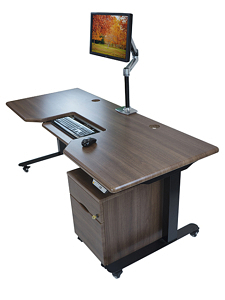 It's just over 21 inches tall, which fits under the minimum heights of the majority of stand up desks on the market. 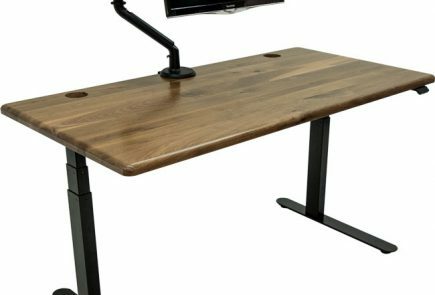 It has a depth measuring less than 21 inches, so you can set it under your desk without worrying about the front end protruding out - provided you aren’t placing it in front of one of the base legs of your desk. And if you do want to place it in front of a leg, the caster wheels will keep the cabinet clear of the desk’s feet (we tested this with all the iMovR desk models and a few others), and the protrusion isn’t as bad as with deeper cabinets. The file cabinet can be placed aside the desk and contribute a complementary top surface, perfect for keeping your CPU or printer, or for rolling out when you need a spare seat for a visiting co-worker. It is equipped with four very heavy duty 2.5" caster wheels (the two front casters have brake locks) that seem to be able to support the weight of an average adult without worry. 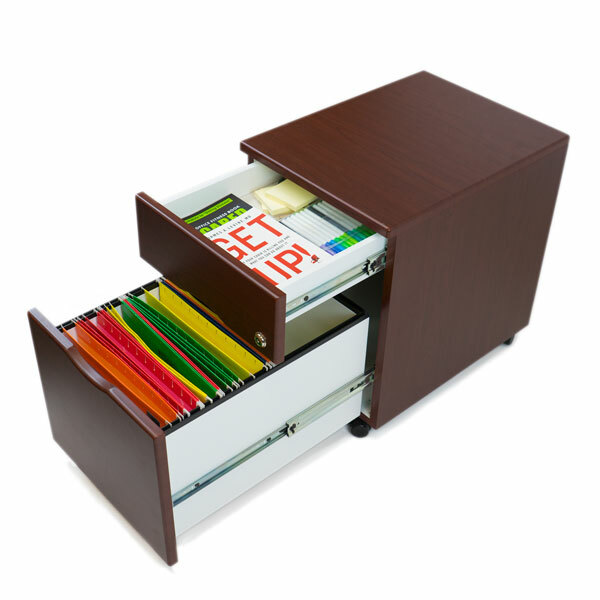 The file cabinet consists of two drawers and a lock that secures both drawers. Each drawer opens and closes smoothly and quietly, thanks to the ball-bearing rails supporting them. Ball-bearing rail systems tend to cost a bit more than the simpler roller styles you see with cheaper discount drawers, but are quieter, more stable, and have a stopper mechanism to prevent the drawers from slamming shut when you close them. The smaller drawer has plenty of space for storing notebooks, staplers, pens, and the occasional candy bar. 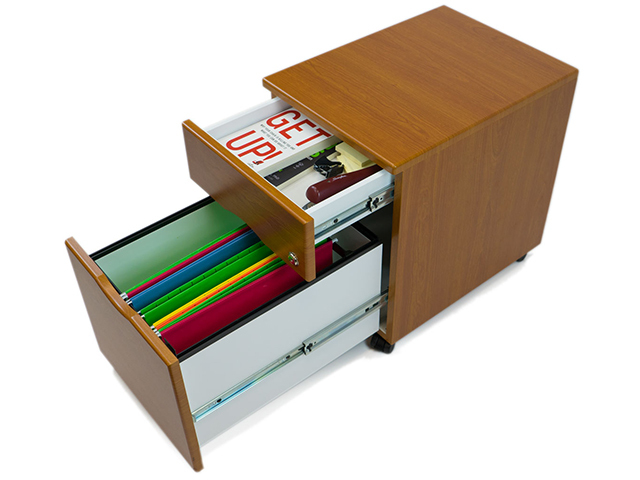 The larger drawer includes side rails and a space divider to support both legal- and letter-sized hanging folders simultaneously. The Mobile Filing Cabinet's robust construction is sturdy enough to use as a quick seat. One of the biggest dangers associated with file cabinets is the inherent tipping risk that develops as your drawers accrue larger and larger loads. It happens all the time: You open the drawer a little too quickly, the weight of the drawer takes the cabinet tumbling to the ground, and you spend the next ten or twenty minutes sorting through piles of paper trying to reorganize your document folder. One solution for preventing catastrophic tip-over is to equip the cabinet with a fifth caster protruding from the front edge. While this gives you a better shot against the tipping risk, it also looks kind of ridiculous. iMovR's solution is much more elegant: Build a heavier cabinet. True to form, their cabinet has quite a bit of heft to it. At a sturdy 75 pounds, it eclipses similarly-sized cabinets by 15 to 45 lbs. Incorporated into the back panel is a lead-weighted ballast that eliminates the tipping risk when you open the drawers. We tested it with four reams of paper and couldn’t get it to tip. 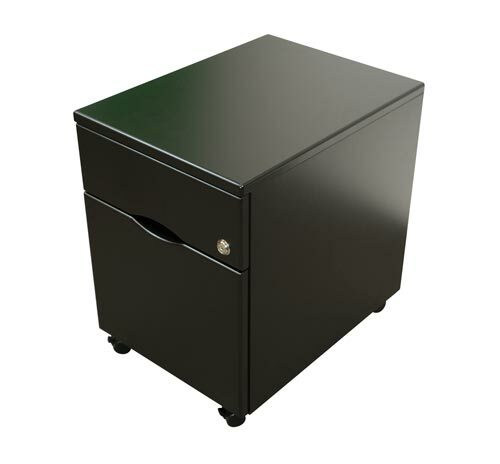 The iMovR file cabinet's heavy-duty construction, improved ball-bearing rails, and durable 3D lamination all indicate a quality product with long-lasting durability. This is why iMovR backs up the file cabinet with a 5-year warranty, the same warranty as all their table tops. Other mobile cabinets, particularly the lighter ones, typically have 1- or 2-year warranties—or none at all. Before you set up your file cabinet, we do advise you to take some time to prep your work area. Your first consideration is cable management. To prevent cords from snagging on your cabinet when you adjust your desk's height, secure your cords in place. iMovR offers a cable management kit with their desks, and those really help keep your workstation tidy and secure. If you're planning on setting the pedestal underneath your desk, make sure there's enough space to set your desk to its minimum height without colliding with the pedestal. The iMovR Elite, Everest, UpTown, and Olympus desks are perfect for this: In addition to their programmable height presets, you can set their minimum and maximum heights to allow more room above the pedestal. If purchased together with any iMovR desk the file cabinet will be produced to order and shipped together on the same pallet, in 5-7 business days. Add 5 business days for delivery to anywhere in the contiguous 48 states. The iMovR Mobile File Pedestal sells for $499 standalone, but you can shave $100 off that price by purchasing it together with any iMovR desk (reflecting a significant savings in freight by combining the purchase).